Wind speed is measured with an anemometer. The most common type is a the cup-type anemometer, shown on the right side of the picture below. The number of rotations per time interval is used to calculate the wind speed. 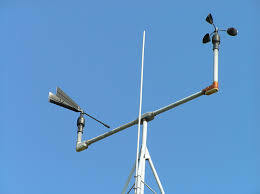 The vane on the left is used to measure the direction of the wind. Wind direction is reported as the direction from which the wind is blowing.